It's time once again for the Crazy Cooking Challenge! 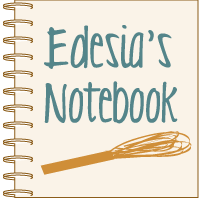 In this challenge, all the participants make and blog about the same dish each month. Each blogger is to scour other blogs for the "ultimate" version of whatever that month's dish is. The goal is to highlight and promote personal food blogs. This month's assigned dish was chocolate cake. So we were to find the "ultimate chocolate cake" recipe, make it, and blog about it. Not long after the announcement was made that this month's dish was chocolate cake, I saw Debbie at The Friday Friends post a recipe for Black Magic Chocolate Cake. It sounded amazing. I had never made a cake from scratch before, sans boxed mix, so I was eager to try it. Debbie made hers into a 9x13" cake, but I decided to go for broke and make a layer cake. My daughter's birthday is coming up later this month, so I thought I could use some exercise in cake making and decorating! I didn't make a single change to Debbie's cake recipe, but I did use a different frosting. The frosting recipe came from Food.com. Here's how I did it. Combine flour, sugar, cocoa, baking soda, baking powder, and salt in a large mixing bowl or stand mixer. Add eggs, coffee, buttermilk, oil, and vanilla. Beat at medium speed for two minutes. Batter will be thin. Pour batter into a greased and floured 9x13” pan or two 9” round cake pans. Bake for 35-40 minutes for a 9x13, or 30-35 minutes for layer pans. Remove from oven and let cool. For the frosting, dissolve espresso powder in water. Beat butter until light. Sift the sugar and cocoa into the butter. Combine, stirring with a spoon until well blended. Stir in the coffee and milk. Beat frosting on low speed until until smooth and light. If necessary, adjust consistancy by adding 1 tbsp of sugar or milk at a time. Frosting will get thicker as it stands. Makes about 5 cups of frosting. Makes a 9x13” cake or a 9” round layer cake. I renamed it "Mocha Fudge Chocolate Cake" because I feel that it is more descriptive of the cake. This cake is AMAZING! It is literally the best chocolate cake I have ever had. You can't really taste the coffee in the cake itself, but I took that idea and ran with it, and used a mocha frosting using instant espresso powder. You can definitely taste the coffee in the frosting and it is so good. It really rounds out the lovely chocolate flavors very well. This is a very heavy and dense cake; super fudgy. I really thought that should be reflected in the name. The texture of this cake is so different from anything you can get out of a boxed mix. And I was really surprised at how little extra work was involved versus using the box. It only took a few minutes to throw the batter together. That was definitely the easiest part of making this cake! I am new to cake decorating, so it's always a struggle for me. Thankfully, my mom was visiting the weekend I made this, so she helped me out with the icing of the cake. I made the frosting a tad on the thin side (because that was how I wanted it), so I had a little trouble getting it to fill in the gap between the layers. My best attempt at smoothing out the top. One big slice of heaven! I am so glad that I stepped out of my comfort zone and ditched the box mix. I had no idea how easy making a cake from scratch was. I'm baking twice for my daughter's birthday later this month: a nice big cake for her party, and then cupcakes to take to school. Should be fun! That sounds DELICIOUS and I love that plate in the top picture! You had me at Mocha ... then fudge ... coffee in the cake! Great flavor combinations, my favorites! How exciting to make your first cake from scratch. I hope you continue to "step out of the box" and share your creations! Your cake is decadently delicious looking! Your frosting looks amazing, and I love the use of the espresso powder! Beautiful! Great job on not using a mix and your cake looks so amazingly rich and delicious. Looks baked to perfection. Love how classic this one looks. That would be a slice of heaven that I would really enjoy right now. Thanks for sharing and hope you have a wonderful week! 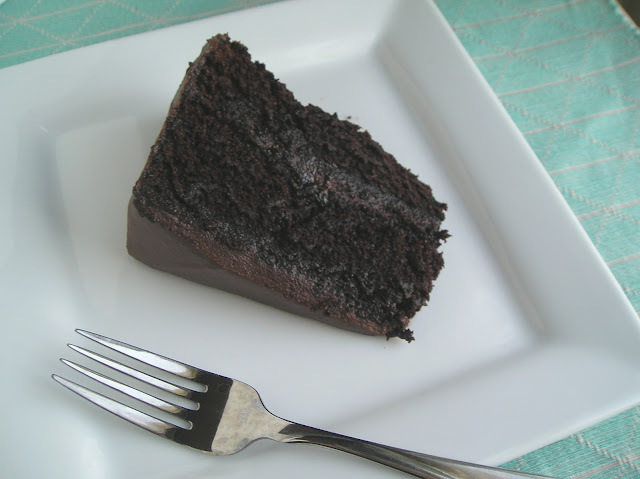 There is nothing like a plain up chocolate cake. That looks fantastic. This cake looks really good. Great job. I'm glad you liked the cake...and really glad you commented so I could visit your blog.. Such fun!! all those cakes look delicious. Lesa, this looks incredible, yum, of course I am partial to chocolate! So decadent and rich! You sure are skilled at frosting the cake! What a gorgeous, delicious, moist looking cake. Definitely Crazy! I'm really going crazy if you don't put that on my plate right now. This is definitely one of the best chocolate cakes I've seen. Can't wait to try it out. Thank you! I know you will love it!